Mike has been a part of many Overhaulin’ episodes over the years. In fact, he also worked on the project featured in the very first episode of Overhaulin’, “Search and Rescue” back in 2004. This Chevy pickup got the True Fire™ treatment in addition to the other build improvements made by the Foose team. Contrary to what some might believe, Killer Paint is actually located in Washington State, not California. So as usual, Mike had to make the flight down to where filming for the show was taking place. But heck, since he was already in the neighborhood, why not make a conveniently appropriate little side trip while you have the opportunity…? …To the headquarters of Foose Design over in Huntington Beach, the place where a lot of Chip’s automotive wizardry comes from. 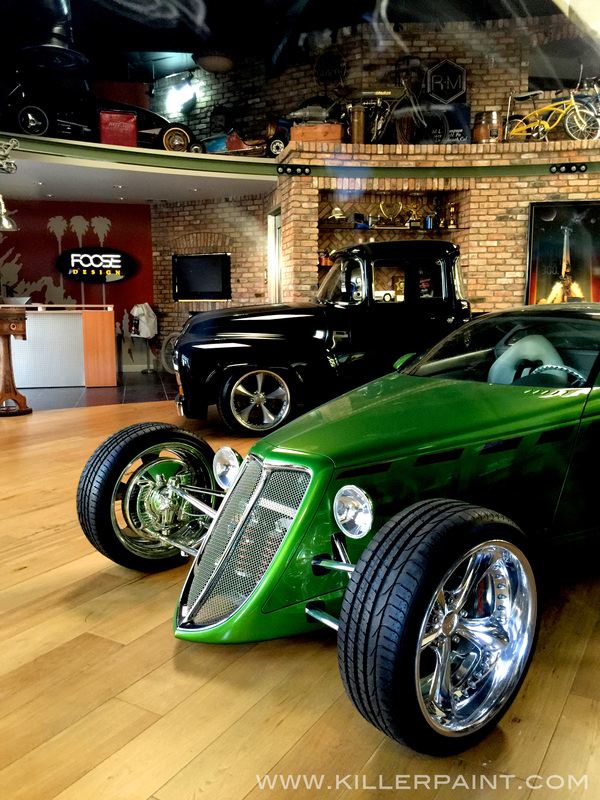 The showroom at Foose Design is quite a sight. There is a lot of eye candy to be seen in the main showroom, including Chip’s 1956 Ford F-100, and the world-famous Hemisfear roadster. Television shows like Overhaulin’ are usually filmed well in advance- often months ahead of time, and not necessarily in the order they air. So a lot of these photos have been waiting a while to be shown. Chip is a master when it comes to drawing up concept renderings, and capturing the exact vision he sees for his projects. His plans for this car included a modified version of the ever-classic Z-28 Firebird Trans Am hood graphic. Starting with a standard Firebird graphic, additional shading was added for some extra dimension, as well as some further elaborations were made on the wing shapes. Some True Fire™ was added to the graphic in a purely golden hue, matching the rest of the layout, which is where Mike comes in. The finished hood still maintains the iconic look of the well-known Firebird emblem, but takes it to the next level. The changes are subtle, yet striking at the same time. This project was a great note for Overhaulin’ to end on. From the very first episode to the very last project, Mike always had a great time when he was on the show, and will miss being a part of some of the great builds that the team had put together. Be sure to watch the final Overhaulin’ episode “Foose and the Bandit” on the Velocity Channel if you haven’t already, to see how the entire project came together. It is definitely sad to see a great show like Overhaulin’ ride off into the sunset. However, the way television works nowadays, you can never be sure that a show like this is really gone forever, and won’t make a triumphant return at some point in the future. So never say never. We hope you enjoyed seeing how this project turned out. Let us know if there is anything you would like to see us post here in the future! 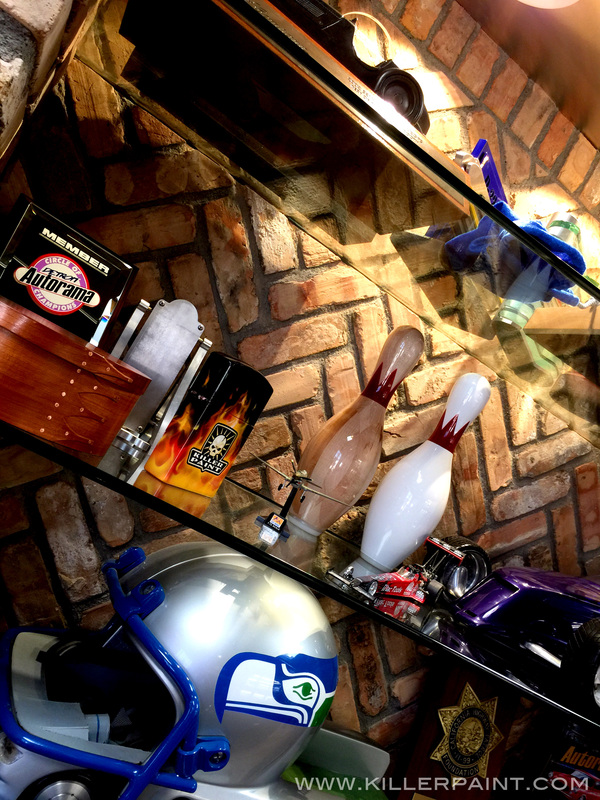 Maybe this project gave you some ideas, or you already have something in mind for your own car, truck, motorcycle, refrigerator, etc?